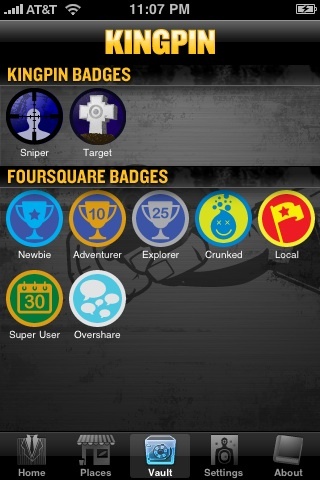 Kingpin, a free social networking application released by Phodder, is a new addition to the foursquare client family. For those unfamiliar with foursquare, its basic premise is to guide you to friends, help you interact with strangers, and explore old haunts and new locales. Users can accumulate points, collect badges to store in vaults, and become mayor (boss in Kingpin) of places they regularly frequent. They can also access recommendations and tips left by other users (i.e. Avoid the tuna fish sandwich at ABC’s Diner–too much mayo) or leave some for others if they’re feeling generous. Kingpin has all the nifty features of foursquare, but it raises the stakes by allowing users to attack local bosses. This violent aspect makes download of the game restricted to those 18 years and older. So how does an attack work? Users start off by checking neighborhood spots like they do in foursquare. Upon check-in, they are presented with two attack options: drive-by and assassinate. “Drive-by” allows you to attack recent check-ins and “assassinate” allows you to temporarily kill a local boss. If you visit a location enough times, you can become boss. Once you reach this status, you can “order hits” on your enemies. And if you become boss at enough locations, you earn the title of Kingpin. The game is very intuitive and easy to navigate with different screens for home, places, vault, and settings. The graphics and font are also simple. What I liked best were the remarks that show up on the screen after you drive by, assassinate, or order a hit. It really incites those of us who are even semi-competitive to replay. It’s a fun way to engage with friends who are close by and interact with absolute strangers who also share your good taste. However, if no friend or boss is in the area, then users can’t do much more than drive by which can get boring fast. The app is best for locations where there are many existing Kingpin users. Kingpin has a lot of potential and I’m sure it will earn a following just like foursquare. I only wish there were sound effects like wheels screeching, machine guns going off, or exclamations a la Mafia when attacks are made. Also, the “Oops!” screen was pretty annoying. It frequently popped up to alert me something was wrong and I couldn’t check-in. Hopefully these little kinks get worked out. Developers are also working on tips and tricks which will be available in future updates. Let’s keep our fingers crossed! Despite these minor issues, Kingpin really tried to make the social media experience more social. Overall, I would recommend this for foursquare newbies and die-hards alike especially at the no-cost of Free. Give it a try. Maybe I’ll see you on Kingpin? Make sure you watch your back. AppSafari review of Kingpin Game was written by Linda Ta on March 6th, 2010 and categorized under App Store, Fun, Games, Social. Page viewed 5089 times, 1 so far today. Need help on using these apps? Please read the Help Page.